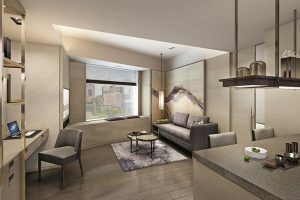 Frasers Hospitality, a member of Frasers Property Group, has kicked off 2018 with a SGD250 million investment to develop a new serviced residence in Tokyo’s prestigious Ginza district. The property will be launched under the Group’s millennial-focused hotel residence brand Capri by Fraser. Expected to open around 2020, it will join Fraser Suites Akasaka in meeting the needs of the growing number of visitors to Japan. Strategically located in Tokyo’s well-known retail and entertainment district of Ginza, the new Capri by Fraser, Ginza / Japan is just a two-minute walk from the main shopping street of Chuo-dori and a four-minute walk from the Shimbashi Station, providing guests with a quick and convenient route to the CBD just two stops away. It will also be close to the Shiodome City Center, which is home to the headquarters of companies such as Fujitsu and All Nippon Airways. “Tokyo is one of the world’s leading cities and we expect a rise in visitors in the coming years as it hosts prestigious global events such as the 2020 Summer Olympics,” said Mr Choe Peng Sum, Chief Executive Officer of Frasers Hospitality. Launched in 2012 to meet the needs of millennials, the Capri by Fraser brand caters to the demands of the e-generation for whom efficiency and connectivity are key. Meeting and conference facilities are equipped with the latest audio-visual capabilities. Guests also have the option to unwind at the 24-hour gymnasium or the all-day dining restaurant and bar. In addition, the brand’s emphasis on social interaction and community plays out in playful and engaging communal areas that are flexible enough to accommodate the diverse needs of guests. “While our focus on personalised service has not changed, we are constantly innovating so that our brands cater to a range of travellers, from the tech-savvy guest seeking a smart design-led hotel residence to the guest who values the bigger living space and amenities offered by a leading serviced residence,” explained Mr Choe. Frasers Hospitality’s global portfolio, including those in the pipeline, stands at more than 145 properties in over 80 cities with close to 23,000 keys.